Media captionBirmingham bin workers: "We just want to work"
Birmingham's nine Labour MPs have written a letter describing the city council as "an obstacle to moving forward" in resolving the bin strike. Refuse workers resumed stoppages on 1 September after a proposed deal, which had seen the seven-week action suspended, fell apart. In the letter addressed to council leader John Clancy, MPs said delays to finding a solution were "unacceptable". The Labour-run council said a swift end to the dispute was its "top priority". 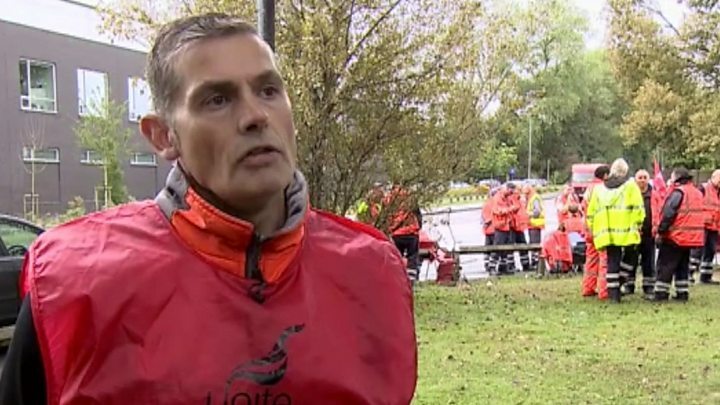 However, Paul Jackson, one bin worker on strike, said he and his colleagues must carry on and see their industrial action through "to its final day". "Personally, I'm losing money," he told BBC News. "There is a strike fund in place. That's helping. I'm grateful for that but yes, it's affecting all of us as a collective. "It's difficult, but we can't give up the fight now. "We've come a long way now and we're going to see it through to its final day now. Until the very, very end." Mr Clancy has resisted calls to step down despite a letter from Labour councillors which stated he had "seriously mishandled" the action. Why are refuse workers striking in Birmingham? Only one of the city's MPs, Conservative Andrew Mitchell, did not put his name to the letter. It was signed by Jack Dromey; Preet Gill; Roger Godsiff; Richard Burden; Khalid Mahmood; Steve McCabe; Shabana Mahmood; Liam Byrne; and Jess Phillips. Image caption The MPs say the bin workers "deserve justice on pay"
In the letter, the MPs condemn "the apparent refusal by the council to answer straight questions on equal pay" and also the "inexplicable" proposal to exclude conciliatory service Acas from the next stage of discussions. "The delay to talks to settle this dispute is unacceptable," the letter says. "Our city now runs the risk of the dispute dragging on for weeks and months to come. "All parties need as a matter of urgency to focus on the reaching of an agreement." John Clancy says he "welcomes communications with the MPs" but it's hard to see how this letter could be seen as welcome. MPs from his own party are pointing the finger of blame for the resumption of the bin strike at his administration. While the leader of the second city says he has no plans to resign over the way negotiations with unions have been handled, behind the scenes some Labour councillors don't expect him to survive until the end of next week. Mr Dromey, MP for Erdington, told BBC News it was "absolutely wrong" not to include Acas. "I cannot begin to understand, neither can my Labour colleagues, why the council wants to exclude Acas from the negotiations. That is absolutely wrong. "We need Acas to be responsible for convening negotiations to broker a settlement, so at last what we have is bin workers are able to do their jobs - also the rubbish, the mountains of rubbish all over Birmingham, is collected." A Birmingham City Council spokesperson said: "We entirely agree with the MPs that a swift end to the dispute is the top priority for the city and we are doing everything we can to ensure this happens, so we have a modern waste management service that citizens can be proud of."